After appearing on our extended watchlist yesterday morning, OXBT had a monster session. The stock was a juggernaut, rising all day from its low of 1.70, up as high as 2.87, good for an intraday gain of 69% on more than 48X 3mo. average volume. We first alerted CETV back on May 10th, as popped up on one of our Form-4 scans. At the time, the stock was trading as low as 2.67, and saw subsequent high of 6.6497. A huge potential profit of 149% Since then, the stock has never dipped below that 2.67 mark, until yesterday, when disappointing third quarter and nine month financials were announced, and CETV was subject to a large backslide. On stocks that see a large gap down, tanking the way CETV did, we watch closely for the establishment of a new base and following recovery. Especially when the sell-off seems to be a knee-jerk reaction to an earnings release. We won’t want to miss any potential rebound action on this one. APP earned us an honorable mention in yesterday’s Penny Stock Rumble for putting in a solid performance. The stock did just what we had hoped, making higher highs and higher lows, and preserving the current uptrend off of its bottom. The daily range was from 1.34-1.52, an intraday move of roughly 13.5% on more than twice the 3mo. average volume. As we stated yesterday, this stock has been on our holiday retail watchlist for years now, and 2013 is no exception. We’ll be very interested to follow the activity on APP over the next several months. This is one we wanted to throw into the mix this morning after including on our watchlist yesterday. The company had some news out that caught our attention, and chart looks like it has some potential as well. Volume has recently been picking up, and the MACD is flipping up to the bullish side. The RSI recently passed the 50-line as well. We’re keeping CYBK on watch for a possible move as we head into week’s end. CORAL SPRINGS, Fla., Oct. 29, 2013 /PRNewswire/ — Cyber Kiosk Solutions, Inc. (PINKSHEETS: CYBK) in May the Company announced 4,000 locations would be coming online using CYBK’s co-branded web based system. This came on the heels of the company’s release of unaudited preliminary third quarter figures, which included 25% increases in both net income and earnings-per-share, and a 23.5% boost to gross profit. This is a steadily growing business that we will want to keep an eye on moving forward. Another winner from the extended watchlist yesterday came in the form of NQ. The stock saw a daily range from 8.74 up to 12.18, and afforded us the opportunity at gains of up to 39% It seems we caught this play off of its bottom and mentioned it at just the right time. As is generally the case when we come across such a play, today we’re on the lookout for the stock to post higher highs and higher lows to confirm an uptrend off of that bottom. 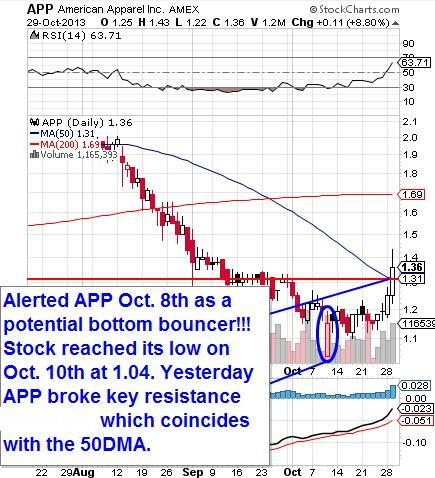 On October 8th, we mentioned that we were watching for a bottom on an old favorite of ours, APP. It had been steadily downtrending since the beginning of August, and it seemed like the right time to re-alert the stock. Just two days later, we saw that bottom, as APP touched 1.04. After waiting patiently for just a few weeks, it seems that APP has finally begun a reversal and is now headed up once again. Yesterday APP broke through a key resistance point, the 50DMA at 1.31, and several indicators are showing strength, including the MACD, which is currently diverging, and we have an RSI which is heading straight into the power zone. The timing here couldn’t much better, as APP has been one of our favorite retail stocks heading into the holiday season for years now. For example, last year, the stock saw a move from .90-2.40 between the months of November and April. The year before, it was from the .50-range up to 1.20. We are excited to see where this year’s retail season takes APP, especially after catching it right off of its dead bottom. 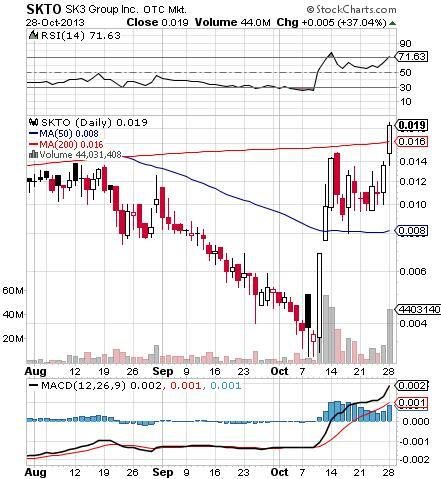 SKTO was one play from our marijuana watchlist to really have a bang-up session yesterday. On more than 5X the 3mo. 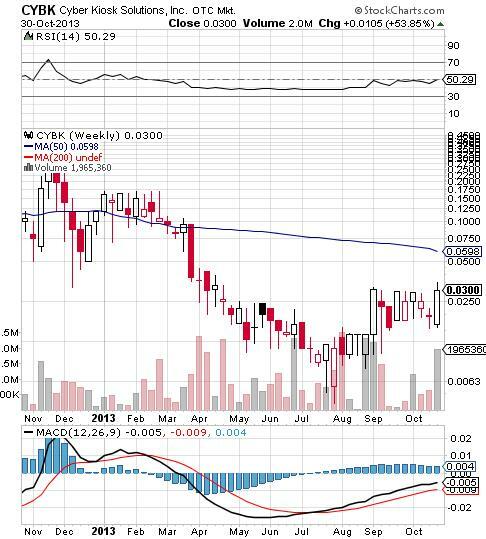 average volume, the stock surged nearly 40% from its early morning low of .0135 to a late afternoon high at .0188. The move not only broke through previous resistance at .015, but continued to roll, surpassing the current 200DMA (.016) as well. Moving forward, we’d ideally like to see support hold above .015. Apple’s quarterly earnings exceeded Wall Street’s expectations on Monday, fueling some extremely volatile post-market trading. After hours, we saw a significant pull-back followed by a bounce which has AAPL currently trading in the low 530′s. Yesterday afternoon’s high in the $542-range is going to act as the next resistance barrier. We made the right choice with our last options call in moving our strike price up to $525, which as it now stands, should be pushed deep into the money with the current trend. To kick off the week, we’re turning the conversation back to both medical and legal marijuana-related stocks, a topic that we have covered extensivelyfor over a year now. Many of our old favorites have begun to show signs of promise once again, so we thought this would be a good time to bring them back into the fold as features in today’s morning report. Last week each of these began finding its way back to our watchlist as we’ve noticed increased volume, and as we’ve learned extensively in the past, volume often precedes price. Thus we are going to want to keep a close eye on these, and indeed the marijuana sector as a whole, which has yet to reach even a fraction of its full potential. Polls show that more than half of Americans now support legalization of cannabis and cannabis products, and of course we know that some states have already taken the necessary steps to make it available to their citizens. ELY appeared in Friday’s extended watchlist, then put forth a performance that merits mentioning. The stock touched a daily low of 7.82 very early in the session before enjoying a steady 14% surge up to 8.90, its highest point since 2010. Our first alert on DUSS came last Wednesday the 16th, at which point the stock jumped from .001-.0015, giving us the chance at intraday gains of up to 50% DUSS would repeat this action the following day, once again bouncing from .001 to .0015. We had DUSS on our watchlist once again on the 23rd following a sell-off from previous highs, and were just in time to catch a low of .0009, and watch the stock jump 44% to yesterday’s close at .0013. Highly volatile plays like this one are not for the faint-of-heart, and while extreme caution should be employed in trading such stocks, it’s plain to see that they can also facilitate a multitude of rapid-gain opportunities. AAPL has continued its uptrend all week, and the 11/01 $505 Calls that we’ve been tracking since 10/16 have continued their ascent as well. They’ve now reached 32.53 from where we began in the $12-range. The $510 Calls, starting out at $10 have charged as high as 28.91. On Tuesday, we talked about moving our strike price closer to the money, while AAPL was trading in the high $520′s; we then saw a pullback to $508, and traders could have jumped into the $525 contracts at a deep discount. They went as low as 9.50, and yesterday touched a 19.70 high en route to a strong close at 19.35. That’s the second time in the past week that our options ideas have yielded possible gains in the triple digits.We are going to stay on top of Apple as the earnings release on the 28th approaches. Historically, the stock has a tendency to run into earnings announcements in addition to high volatility on the day of release. We’ll be ready and waiting to time our plays accordingly. We caught STWG on a volume scan back in December of last year. In subsequent months it ended up showing us a huge move from sub-penny levels up to .02, and presenting the chance at quadruple-digit gains, as some of our long-time readers might remember. 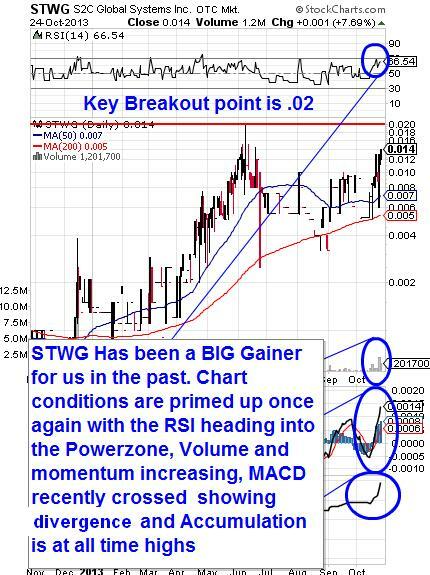 We are looking toward STWG once again, as it seems momentum has been picking up recently; volume has been increasing and accumulation is at an all-time high. We are going to be monitoring for a move past that previous swing-high at .02, which would trigger a blue sky breakout. BARCHART.COM currently lists STWG with 100% “Buy” Ratings in both the short and medium term.